In Talavera La Real, located only 20 kilometers from the Portuguese border near the town of Badajoz in the province Extremadura, lies the birthplace of every Spanish fighter pilot. 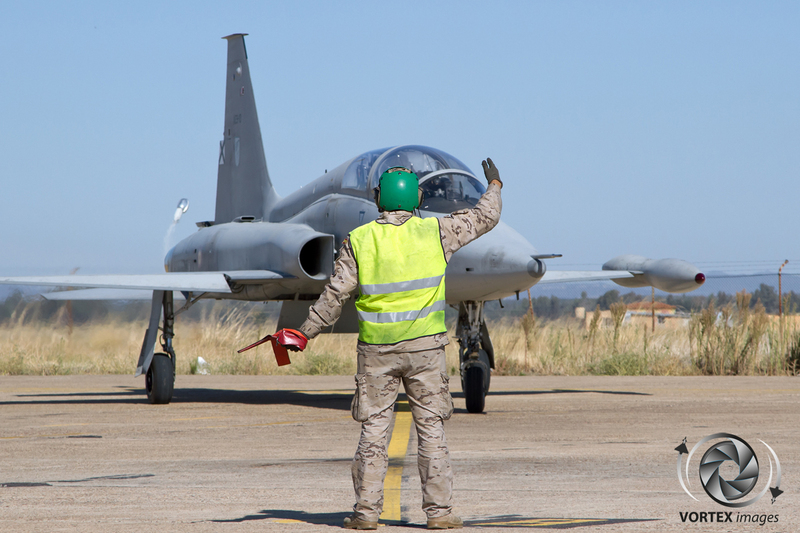 It is Ala 23 which teaches these young pilots how to become a fighter pilot. 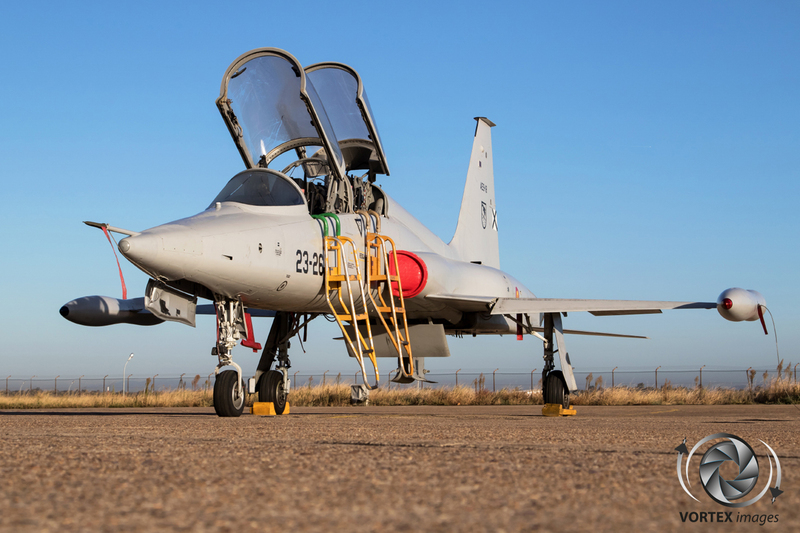 Their weapon of choice is the iconic Northrop F-5 Freedom Fighter. 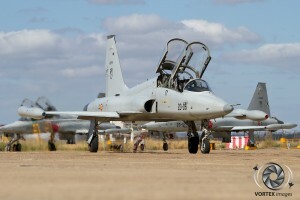 In 1966 Spain signed a contract with Northrop for 70 aircraft which would be built by Spain’s own aviation company CASA. 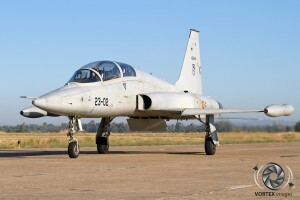 Instead of the normal designation, the aircraft built by CASA were named SRF-5A (reconnaissance version), SF-5A (Single seat fighter) and SF-5B (Dual seat fighter/trainer), with the “S” showing that these were CASA built airframes. 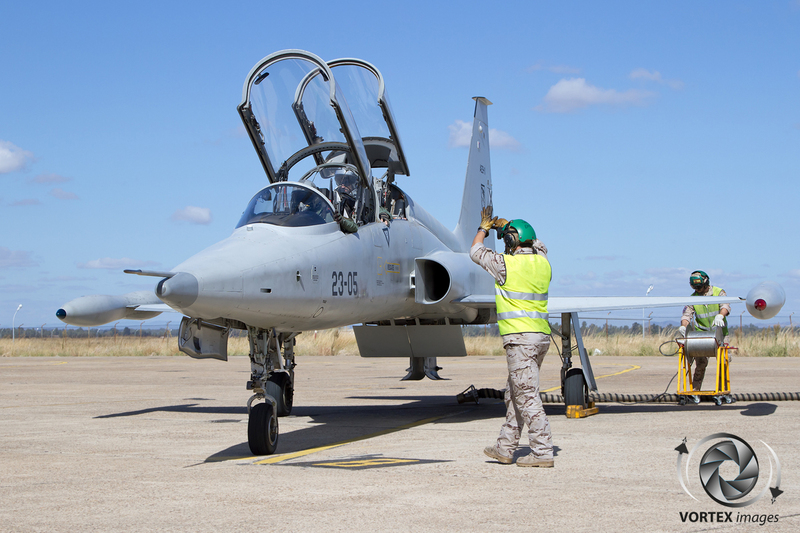 The aircraft have been operational since 1970, and of the 70 airframes built, 19 are still in service with Ala 23 (23rd Wing) at Talavera la Real Air Base, all of which are SF-5B aircraft. 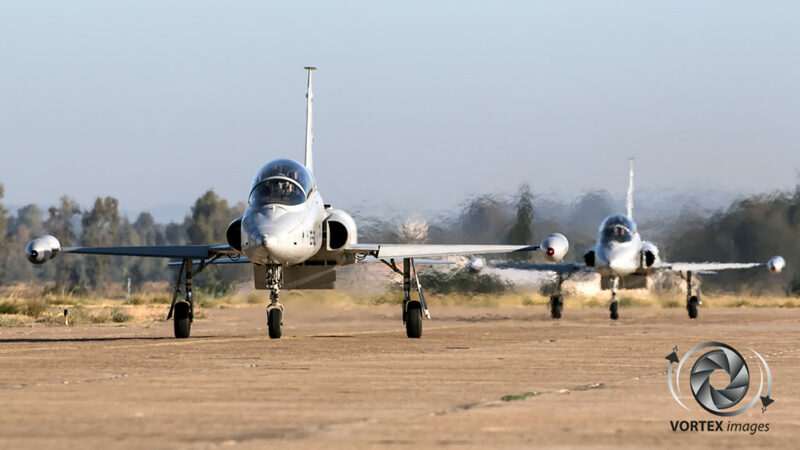 In the year 2000, a contract was signed with Israel Aircraft Industries (which then subcontracted it to CASA) to upgrade the remaining 19 airframes to SF-5M standard in order to have aircraft avionics similar to the modern fighters in service with the Spanish Air Force. This is a significant upgrade, and includes a glass cockpit, Hands on Throttle and Stick system, Head-Up Display , Multi Function Displays, Global Positioning System, Inertial Navigation System, Virtual Radar System, Video Tape Recorder and, in a later stage (2009), the Martin Baker Mk-16L (zero-zero) Ejection seat, which is the same as in the Eurofighter. Before the upgraded ejection seats, the pilots needed to strap themselves onto their parachute before they could enter the cockpit. The upgrade by IAI transformed the SF-5 from a 2nd Generation lead in-fighter trainer into a modern lead in-fighter trainer. This resulted in the SF-5 being the appropriate step forward from the C101. So far, all but three aircraft have been upgraded. These final three are expected to be returned to service by CASA in the near future. The first complete training course on the SF-5M was completed in 2005. 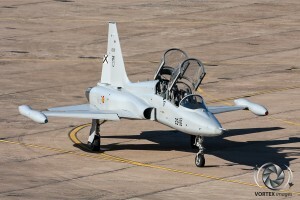 This was such a success that Northrop based it’s upgrade of the T-38 on the SF-5M upgrade. 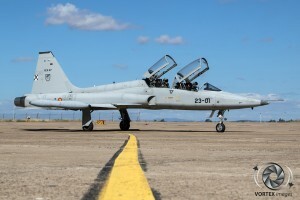 The Spanish Air Force expects the SF-5M to stay in service until 2025-2030, as the current upgraded aircraft have about 15+ years flying time remaining. Ala 23 currently has 16 instructor pilots on strength. The number of instructor pilots varies each year as instructors join and leave annually pending the personnel requirements. 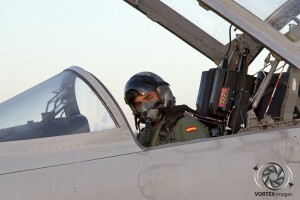 Colonel De Andrés explains: “During the first trimester the 23rd Wing Commander estimates the number of instructors required taking in consideration the number of pilots that will leave during the following year. 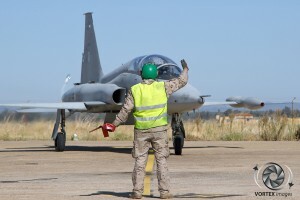 Consequently our Personnel Command determines how many pilots have to be taken out from the operating Wings so they can serve as Instructors in Talavera for at least 2 years, and if needed some of the student pilots that just finished their fighter course can be requested to stay as instructors (FAIP / First Assignment Instructor Pilot). 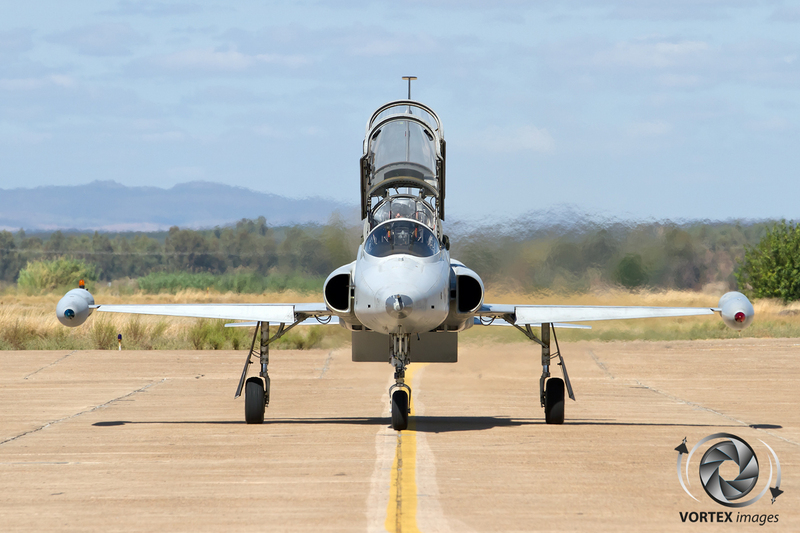 These FAIPs are given a longer instructor pilot course plan, since they do not have previous experience as fighter pilots.” The pilots that become Instructor Pilots must first complete the Instructor Pilot Course which is custom made and takes into account the previous experience of the pilot. Among the instructors at Ala 23 are two from the Argentinian Air Force (two new Argentinian instructors join Ala 23 every two years). 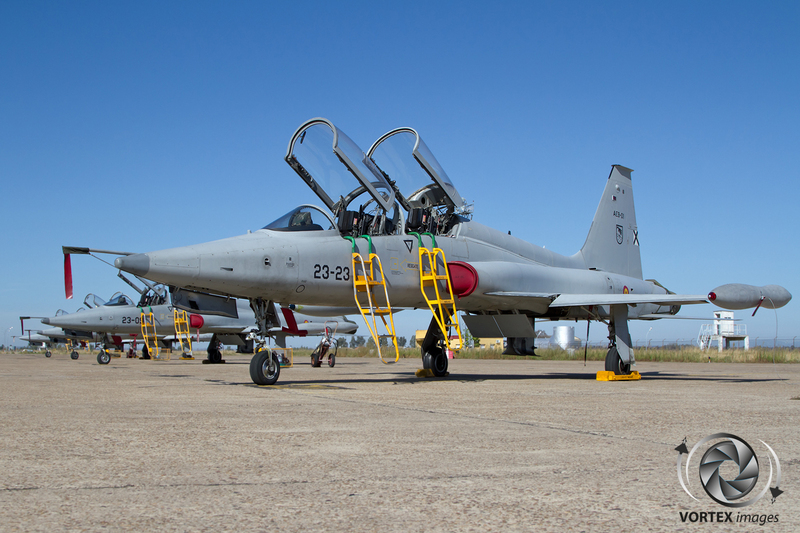 The cooperation between the Argentinian Air Force and Spanish Air Force began 23 years ago. 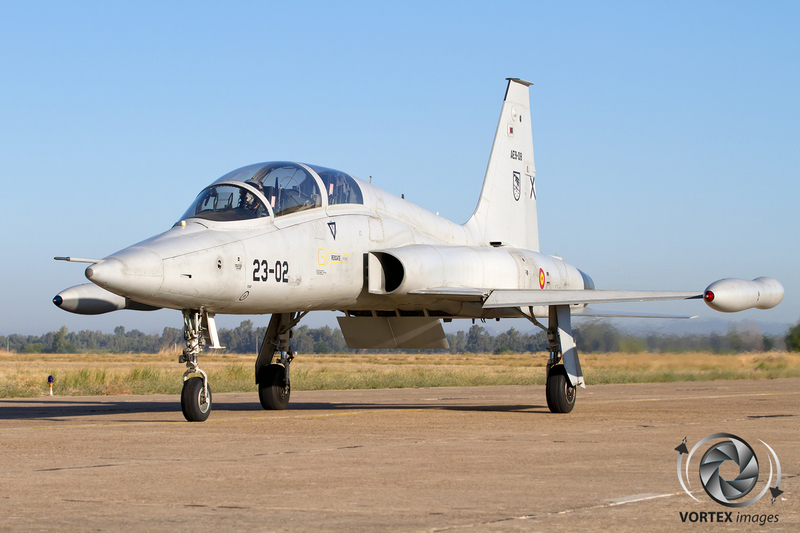 The reason for the Argentinian instructors joining Ala 23 was that they brought an extra dimension into the flying course, and also their combat experience (much of which was learned during the Falklands War). 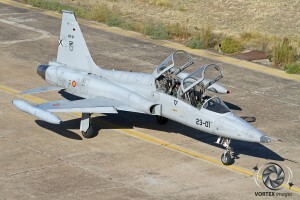 Also having two foreign instructor pilots in Ala 23 means that two fewer pilots are taken out of the operational units of the Spanish Air Force, and they bring different procedures and techniques into Ala 23 which improves the overall level of performance. The posting to Ala 23 is the most popular posting among the Argentinian pilots, as although they are able to be posted to the United States, Italy and Spain, the only place where Argentinian instructors are allowed to fly Air to Air and Air to Ground missions is with Ala 23. 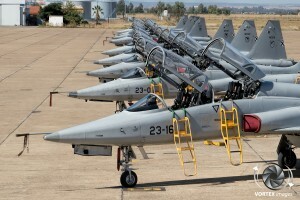 In order for an Argentinian pilot to be selected to go to Spain and join Ala 23 they must have certain experience. They are required to have at least 500 hours of flying time on their current aircraft type and must have the rank of Squadron Commander. 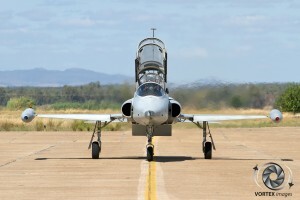 It is also in their favor if they have already had an Instructor Pilot posting in the Argentinian Air Force. 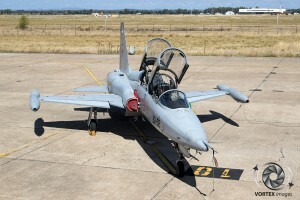 Currently there are no Spanish Instructor Pilots in Argentina, although a few years ago the Spanish Air Force sent an exchange pilot to an IA-58 Pucará unit and another pilot to become an instructor on the IA-63 Pampa. Before the students join Ala 23 they first have to complete their basic military and flying training. The Military Academies in Spain are fully integrated in the national educational system. In order for a student to apply for the Spanish Air Force they must have one of the highest grades of their class at high school. In addition to these grades they must pass a English language test, a physical test and pass the medical examination. 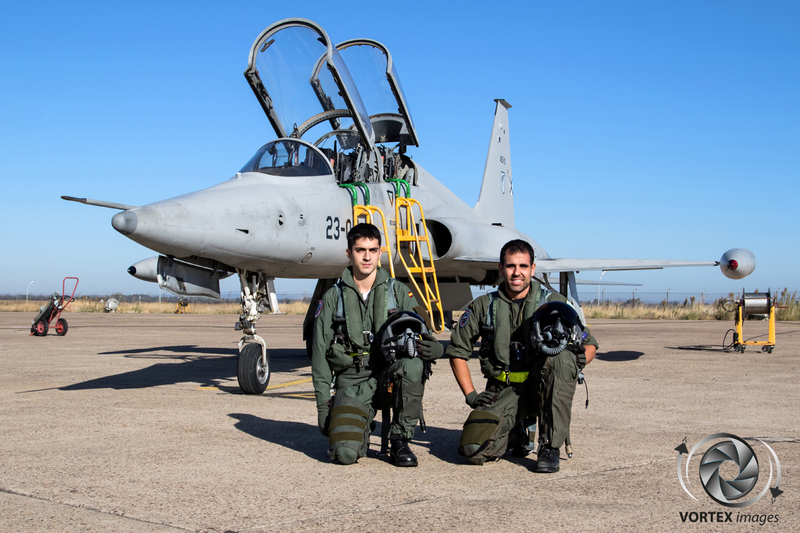 Once the applicants have been selected to join the Air Force Academy (Academia General Del Aire), they become Air Cadets. 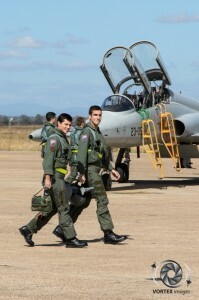 During the first two years the students study Engineering and Aeronautical subjects and undergo basic military training. At the end of their second year they are promoted to 2nd Lieutenant and start flying. 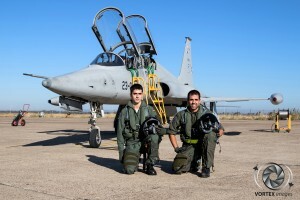 Their first steps as a pilot are taken in their third year, on the ENAER T-35 Pillán with Escuadrón Elemental (Elementary Squadron) located at San Javier Air Base. Here they fly around 50 hours and learn how to navigate and fly in formation. 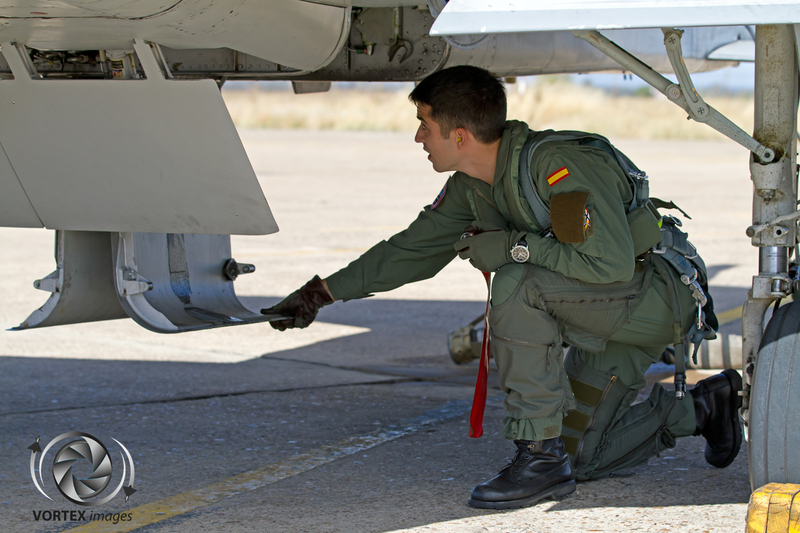 During the third year the students are tested in order to see if they have the flying skills required to become a pilot within the Spanish Air Force. 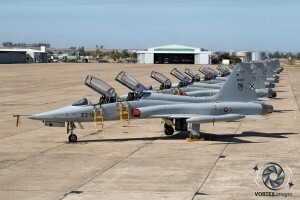 If they fail to pass these tests they are grounded and will be assigned to another role within the Spanish Air Force such as Air Traffic Controllers or GCI (Ground Control Interception) Controllers. The students that successfully complete these 50 hours will continue into the fourth year, which is on the CASA C101 Aviojet with Escuadron Básico (Basic Squadron) also located at San Javier Air Base. Here they fly another 100 hours and learn how to fly a jet aircraft. 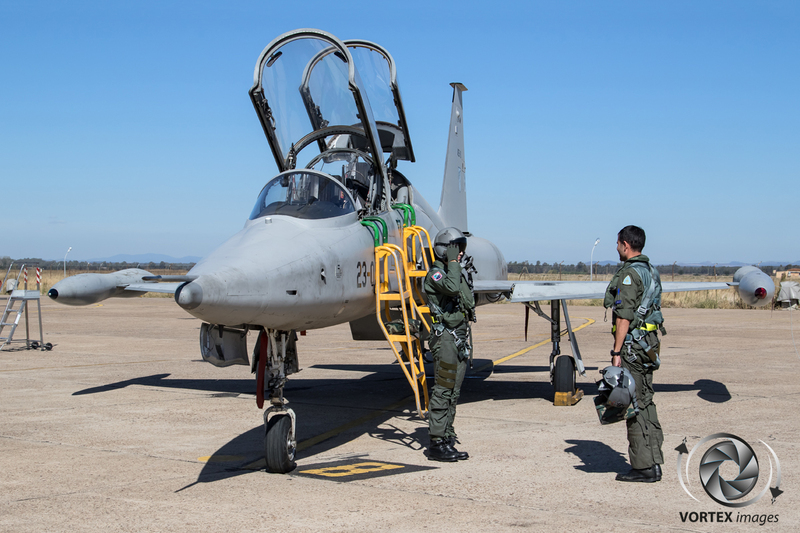 When this course has been completed, the students with the best grades are selected to become fighter pilots and will be sent to Ala 23. 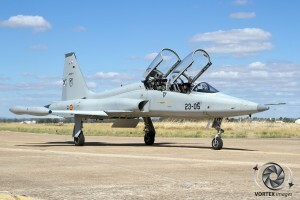 The fighter course at Talavera is the fifth and final year of the student. 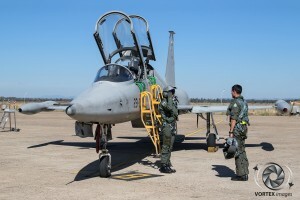 In order to be allowed into this fighter course the student must be graded above average during the previous four years, especially in subjects such as Flight Systems and Procedures. 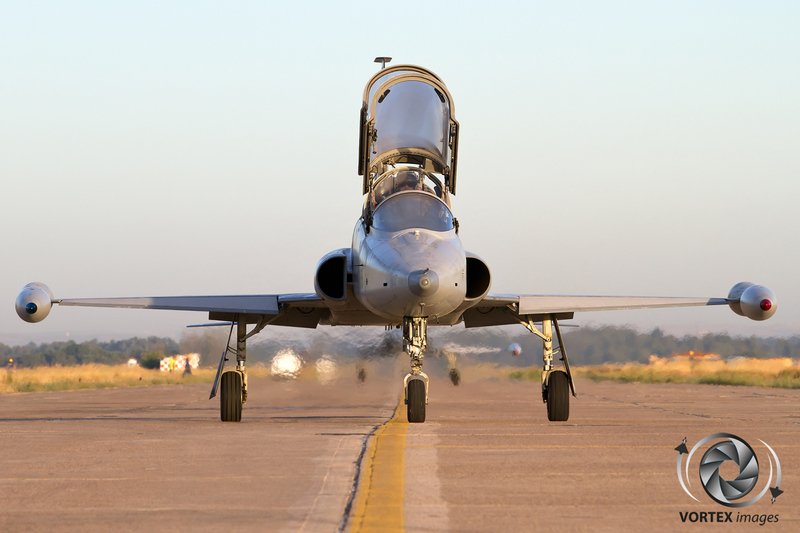 The number of students that are selected to become fighter pilots varies each year from 10 to 14. The students that have passed the flying phases but are not selected to become a fighter pilot are then assigned to become transport or helicopter pilots. 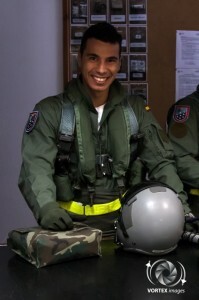 The Fighter pilot training course lasts for one year. The flying course normally starts in September and ends the next year in May. After completing the flying course the students go back to the Air Force Academy for some final academic activities and graduate in July. 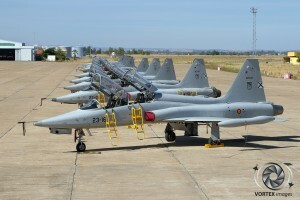 The students of Ala 23 are known within the Spanish Air Force as “Los Patas Negras” (The Black Legs). “Los Patas Negras” refers to both a famous dish from the Extremadura region, made from the meat of the “black” legged local pigs, and also the students’ military issued black flying boots. The badges of Ala 23 have adopted black claws/talons as their symbol representing a bird of prey which is able to perform risky and masterful maneuvers to catch the prey. The fighter pilot course on the SF-5 consists of six phases: Transition, Basic Formations, Instrument, Tactical Formations, Air-to-Ground Tactics and Air-to-Air Tactics. The students perform their first solo in a SF-5 after 11 missions. The first phase takes two months. The first month is theoretical preparation and during the second month they transition onto the SF-5. 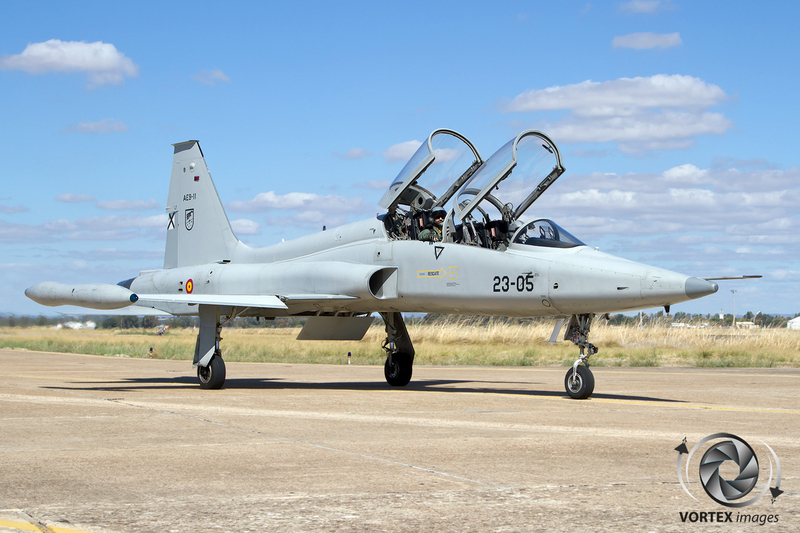 The Basic Formations and Instrument phases of the course last two and a half months, and are then followed by one and a half months of tactical formation flying. The final two phases, Air-to-Ground Tactics and Air-to-Air Tactics, take the student almost 3 months to complete. During these six phases there are also three navigation flights of which one is performed solo. The students are graded according to an internal procedure, which grades the various elements in the course. Once each element has been graded, the instructor pilot assesses the overall performance of the student. The grading is done by colors, from Red, which means failed, to Blue, which is the highest grade. At the end of the flying course the student with the highest flying grade gets an award. His or her name is written on a plaque that contains all the Number 1 students in the history of Ala 23. Each year the Air force headquarters in Madrid publishes a list of available slots at the operational squadrons. Once this list is published, the newly graduated pilots may choose their posting, according to their individual grades (The highest scoring students may pick their slot first). After their graduation the new pilots are assigned to an operational squadron to fly one of the fighters in service with the Spanish Air Force. 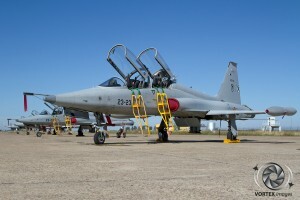 This can be the EF-18 Hornet (Ala 12 at Torrejon Air Base, Ala 15 at Zaragoza Air Base and Ala 46 at Gando Air Base) or the EF-2000 Eurofighter (Ala 11 at Morón Air Base and Ala 14 at Albacete Air Base). Before they become fully operational they first join the OCU (Operational Conversion Unit)for the respective types, 153rd Squadron at Zaragoza being the OCU for the EF-18 Hornet and 113 Squadron at Morón the EF-2000 Eurofighter OCU. 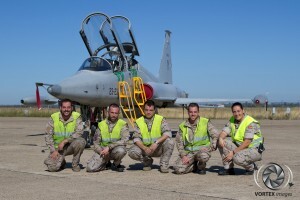 After they have finished the 6 month OCU course they are fully operational fighter pilots. One could imagine that due to its geographical location, which only has 40 days of rain each year, other air forces might be interested in the fighter pilot course at Talavera. “From time to time the Spanish Air Force receives request from allied air forces, but the current capacity of Ala 23 is not enough to accommodate any more than the Spanish Air Force students. 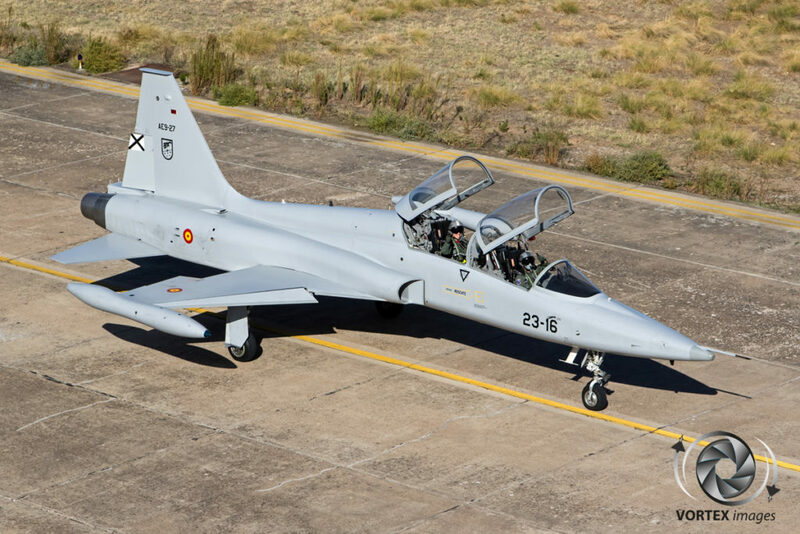 There is however a possibility that an Argentinian student pilot will attend the course next year but nothing is final on the matter as of today.” Colonel De Andrés explained. We would like to thank Colonel de Andrés, Public Relations Officer Gordillo Fernández, Commander Fernandez de Bobadilla Lorenzo and all the personnel of Ala 23 for their cooperation and hospitality.